Exertional sickling is a medical emergency occurring in athletes carrying the sickle cell trait. 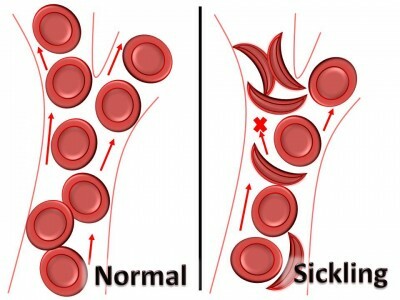 When the red blood cells(RBC) change shape or “sickle” this causes a build up of RBCs in small blood vessels, leading to decreased blood flow. The drop in blood flow leads to a breakdown of muscle tissue and cell death, known as fulminant rhabdomyolysis. How do you prevent exertional sickling? Adapted from: Eichner, ER. Sickle cell considerations in athletes. Clin Sports Med. 2011;30:3:537-549. How do you treat an individual with exertional sickling? Gradual return to play based on level of sickling and severity of symptoms. National Athletic Trainers’ Association consensus statement: sickle cell trait and the athlete. National Athletic Trainers’ Association. 1-5. Eichner, ER. Sickle cell considerations in athletes. Clin Sports Med. 2011; 30:3,537-549. Eichner ER. Pearls and pitfalls: exertional sickling. Curr Sports Med Rep. 2010;9:3-4. Eichner ER, Anderson S. Exertional Sickling. In: Casa JD, ed. Preventing Sudden Death in Sport and Physical Activity. Sudbury, MA: Jones & Bartlett Learning; 2012;131-141. McGrew CA. NCAA football and conditioning drills. Curr Sports Med Rep. 2010;9:185-186.